The brief presidency of Donald Tresidder (1943–1948) profoundly affected Stanford’s architectural character and direction after World War II. In 1944, Lewis Mumford, one of America’s foremost critics of modern culture, architecture, and urban planning, was hired as professor of humanities within Stanford’s newly organized school of humanities, a position he occupied until 1945. (Mumford was introduced to the dean of the school by Paul Hanna, who had commissioned Frank Lloyd Wright to design the Hanna “Honeycomb” house in 1936.) Following Mumford’s recommendation, Tresidder established the first university planning office. He named as its director (on a part-time basis of 80 hours a month) Eldridge T. Spencer, a Beaux Arts-trained San Francisco architect. 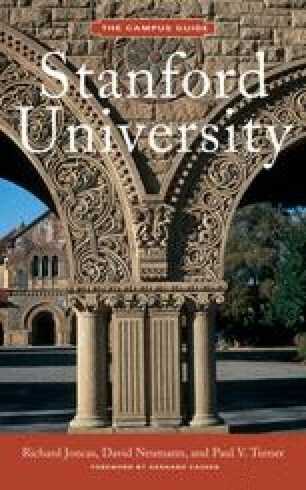 Shortly after leaving Stanford, Mumford was invited to review the progress of the planning office and to draw up proposals for developing a master plan, including recommendations for its architectural character.